The 19th Century saw a massive growth in the British pottery industry with the production of functional, durable and decorative ceramic tableware. The durable nature of the pottery being produced and the ability to use transfer-printing, meant that customers still wanting Oriental patterns could now have the patterns on a much more dense, and stronger “china”. Pictured: A Mason’s Ironstone Part Dinner Service Late 19th Century, Impressed And Black Printed Ironstone China Marks Each piece with a figural chinoiserie vignette within a paper scroll and oyster ground punctuated with floral sprays and cartouches of precious objects. 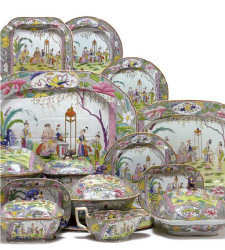 The set comprised over 100 plates, platters, dishes etc. Sold for $50,400 at Christies, New York, 2006. Image Copyright Christies. The manufacturing process could also be scaled up and the production moved to large factories, the cost of items was reduced and a new market of aspiring middle classes could now afford household china for everday use. This move supplanted the more delicate Chinese style porcelain that was common at the time. One such material was ironstone – a hard, dense and durable, slightly transparent white earthenware. The first form of ironstone was thought to have been manufactured by William Turner around 1800 at the Lane End potteries at Longton, Stoke-on-Trent. A number of potters were experimenting and it was also known as semi-porcelain, opaque porcelain, English porcelain, stone china and new stone. 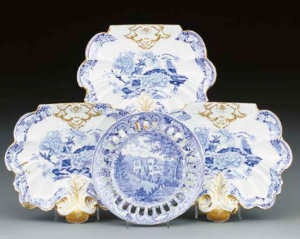 Pictured: A William Mason blue and white dessert-plate and three Mason’s Ironstone dishes Circa 1820, the dishes with printed and impressed MASON’S PATENT IRONSTONE CHINA marks The dessert-plate printed with the ‘Furness Abbey’ pattern, within moulded arcading and broad borders of scrolling cartouches of landscapes divided by passion-flowers and convolvulus, the dishes of leaf-shaped form with double-scroll handle, printed with the ‘Blue Pheasant’ pattern (all with riveted repairs and slight chipping, and staining to first) The first 7½ in. (19 cm.) diam., the second 9 5/8 in. (24.4 cm.) wide (4). Sold for £688 at Christies, London, 2009. Image Copyright Christies. Ironstone was first patented in 1813 by Charles James Mason, the son of Miles Mason. The Mason’s were a family of potters and had been developing a number of potting techniques at their works at Lane Delph, Fenton. The patent was No. 3724 was for a process for the “Improvement of the Manufacture of English Porcelain’, IRONSTONE PATENT CHINA”. The initial patent was for 14 years and was not renewed. Other companies such as Davenport and Hicks, Meigh & Johnson started producing similar wares. 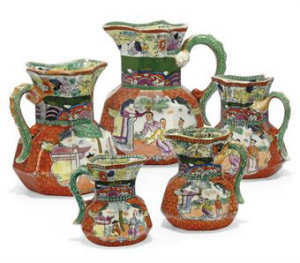 Pictured: Eight Mason’s Ironstone Jugs Circa 1825-35, Black Printed Marks Of octagonal form and graduated in size, painted with Oriental figures within shaped cartouches on an iron-red tiled ground The tallest 7½ in. (19 cm.) high (8). Sold for £688 at Christies, London, 2009. Image Copyright Christies. At the time the patent was taken out the ownership of the company was transferred to Miles Mason’s two sons and became known as G. & C. Mason or G. & C. Mason & Co. Family members include Miles Mason, his sons William Mason and Charles James Mason, and George Miles Mason.The company enjoyed enormous early success and continued to introduce new wares and designs. However, a change in fortunes saw Charles James Mason declared bankrupt and the firm close in 1848. Charles James Mason started a new factory at the Dasiy Bank Pottery but he died in 1856. At that time all the Mason patterns and moulds passed to Francis Morley. Morley and the Ashworth family formed a partnership during the period 1858-60, at the Broad Street works in Hanley. In 1862 Morley retired and passed everything to Ashworth including the Mason patterns, copper plates, moulds and trade marks. The company was acquired in 1884 by John Shaw Goddard and remained in the Goddard family until 1973 when the firm joined the Wedgwood Group. MILES MASON Miles was born in December 1752 in the village of Dent, Yorkshire. By 1769 he had moved to Chigwell where he was a neighbour of the Farrar family. On 13th August 1782 he married Ruth Farrar at St. Gabriel’s, Fenchurch Street. He was aged 30 but she was only 16 years old. After the marriage Miles became tenant-in-chief of a fine house and other properties at Chigwell Row, Essex which had previously been let to his late father-in-law by the Lord of the Manor of Barringtons. Apparently he never lived there. On 8th September 1783 Miles became a Freeman of the Glass-sellers’ Company and took the Livery on 23 September 1784. He was the founder of the Mason company and was producing porcelain of a high quality from the early 1800’s. He started by taking over the business of selling imported china which had been started by Richard Farrar, his father-in-law, in London in about 1783. Much of the porcelain sold was of the shape and design of the very popular Chinese export market porcelain. At this time a producer of such wares was called a ‘chinaman’ – a producer of china. By September 1784 he had taken over the china business of Richard Garrett. In 1793 he moved with his family from Fenchurch Street to 41 Finsbury Square and it was at this time that he was master of a City Livery Company. In 1796 Miles had moved to 25 Queenhithe near Blackfriars and it was a this time that he became a partner in three different partnerships and was involved in the manufacturing and retail sides of the pottery trade. One partnership was with Thomas Wolfe of the Islington China Manufactory, Folly Lane, Liverpool, a manufacturer of earthenware, a second with James Green of Upper Thames Street, London, a wholesale pottery-dealing company and thirdly a partnership was formed with George Wolfe so that he could make eartherware at Lane Delph. In June 1800 he dissolved the partnership with Thomas Wolfe, due to the heavy duties that were imposed by the Government in 1799 on the import of the chinaware, as a result of trouble with the East India Company. The other partner, James Green died in 1802. The third partnership, that between Miles and George Wolfe of Fenton Culvert, otherwise Lane Delph, in Stoke-on-Trent, Staffordshire, was dissolved on 19th July 1800. This prompted Miles to depart from the London wholesale and retail china trade. Miles Mason moved to Liverpool where, by October 1804, he became involved in the manufacture of china at Lane Delph which was to become known as the Victoria Works, Market Street, Fenton. He produced china , and was manufacturing porcelain which was marketed under the name ‘British Nankin’ , there until 1806 or 1807, He produced tea and dessert services in bone china. This ware was very popular and many teapots, sugar boxes and cups were manufactured especially in the Pagoda pattern.. This was the start of ‘Mason’ as a company. He later moved to the Minerva Works at Fenton, where he worked until June 1813 when his two sons took over the business. Miles had moved to 44 Mill Street by 1816 but in 1818 he was at 1 Phythian Street, Low Hills, Liverpool. A while before his death Miles moved back to Staffordshire where he died on 26th April 1822. He was buried in Barlaston churchyard. Miles had another two children, both girls, apart from his three sons, one of whom died in infancy. WILLIAM MASON William, the eldest son of Miles Mason, was born on 27th January 1785. William worked with his father from c 1806-11 helping with the production of small amounts of transfer blue printed useful wares – especially in the ‘Netley Abbey’ and ‘Furness Abbey’ patterns. It appears that he worked at Sampson Bagnall’s potworks at Fenton Stone Works which he had taken over with his two brothers on 14th June 1813 but only for a short period of time as by early 1815 he was a pottery dealer /retailer at 1 Smithy Door, Manchester. During his time at Fenton he was shown to be no business man as he got into debt to Wedgwood which was the company which supplied him with blue-printed and cream-coloured earthenware. His father agreed to pay off the debt of £40 as all supplies had stopped on 14th October 1815. When his father died in 1822 he took a pottery in Fenton Culvert. but in November 1828 meetings were held for the ‘Creditors of William Mason of lane Delph. It seems William was unable to pay his debts yet again. He subsequently moved to London in 1828 where he was an auctioneer. He remained in London until 1837 when his address was Denstone Cottage, Alton, Staffordshire. In the same year he ‘was admitted’ as a tenant to properties at Chigwell Row, Essex, a right he had gained as the eldest son of his mother Ruth Mason. but he never lived in any of the properties. He preferred to sublet these properties until 1855 when he sold them for £400. William was married to Susannah Hemming on 12th January, 1808 by the Rev. Samuel Shipley the Rector of Ashbourne and vicar of Mapleton. It is not known for certain exactly when William died but he was still alive in 1860. It is possible that he died in 1862 at Wolfscote in the parish of Hartington, Derbyshire as this is not far from Alton, his last known address, or from Norbury, the village where both his mother and his brother George Miles are buried. If this is the correct date of death he left an estate worth under £200. GEORGE MILES MASON George was born on 9th May, 1789. He was a graduate of Oxford in 1807 (Brasenose College) He obtained a BA in 1812 and gained his MA in 1814. In 1813 between his two degrees he was a churchwarden at Stoke, where part of his business was to keep the church accounts, arrange for policing of the neighbourhood and administer the Poor Law. In 1814 George married Eliza Hemming, the sister of his elder brother’s wife, at the same church and by the same vicar as his brother. The following November their first child, Eliza Mason, was born at High Croft. He also had two sons, George Hemming Mason (1818-1872) and Miles Bailey Mason (1820-after 1883). George Miles was more artistic than William and greatly influenced the style of patterns and decoration used on the wares produced by G.M. & C.J. Mason. He was also responsible for the administrative side of the thriving pottery business but he did not like the sordid aspects of the trade so he retired early in 1829. After his retirement he spent his time as a cultured country gentleman. Among his other interests and deeds, it was he who established a mail coach route through the Potteries and joined the membership of a Committee of Manufacturers which had been instigated to protest against the Window Tax of 1815. In 1853 George was living at Wetley Abbey which was a neo-gothic mansion near Leek which he had bought at the time of his retirement. His health by now was not good – he suffered epileptic fits possibly brought on by heavy smoking. His bad health caused him to make a will on 2nd March 1853 and another one in November 1853. By 1859 he no longer lived at Wetley Abbey but had moved to Breem in the Forest of Dean in Gloucestershire where he died on 31st. August, 1859. His estate was valued at under £200 and he was buried beside his mother in the churchyard at Norbury, Derbyshire. There is no headstone but there is a gothic wall monument in the church at the end of the north isle. CHARLES JAMES MASON was the younger son (born 14th July, 1791 in London) who patented the famous ‘Patent Ironstone China’ in July 1813, when only aged 21 years. On 14th June 1813 he joined with his two brothers and enetered into an agreement with Sampson Bagnall to buy a ‘Messuage Potworks Land and premises at Lane Delph (Fenton Stone Works). He married Samuel Spode’s daughter Sarah on 31st August 1815 at Stoke Parish Church. They were to have two children, Charles Spode Mason and Florence Elizabeth Mason. He continued to build up the Mason company by giving a matching service – supply of china in patterns already provided to the gentry – and by using a country-wide system of selling china by auction. Items made include tea services, dinner services, Stilton cheese tubs, hydra jugs, egg pipkins, tea and coffee sets, complete chamber services, foot pails and slop jars. Outside of his business interests Charles made charitable donations to Stoke Parish church, providing a clock, a new peal of bells and an organ. He instigated a market at Fenton with regular stalls and became Chief Bailiff of Fenton. He was also involved with the railway and workers’ rights. He became a member of the Potteries Chamber of Commerce. His house at Heron Cross was very fine and beautifully furnished but it was attacked in 1842 during the Chartist Riots. There was a six month strike by the workers in 1843 over his attempts to introduce new machinery. By 1844 Charles’ fortunes began to decline and Thomas Kinnersley & Co, the chief bankers in the Potteries, called in a debt of £2000 towards the end of 1847. Although he was declared bankrupt in 1848 he continued to work at Daisy Bank Works and live with his family at Longton until 1853 when he was forced once again to sell up. He exhibited ironstone wares at the Great Exhibition at Crystal Palace in 1851. This included garden seats, fishpond bowls, jars and plates. About 1852 he married for a second time, to Miss Asbury of Longton and was to have a child by her, Annie born in 1853. He died on 5th February, 1856 and was buried beside his first wife, Sarah Spode, in the Mason vault at Barlaston churchyard.